Located in the heart of Downtown Brooklyn’s Cultural District, Roulette is a venue, presenter, and producer housing today’s most cutting-edge, experimental dance, music, and intermedia work. We also host community organizations, youth events, educational programs, and more in our renovated 1928 art deco theater. Over 70,000 people come through our doors each year for our 120+ performances, and 180+ community events and special productions. With Roulette’s 40th anniversary starting in Fall 2018, this is an exciting and visible time to partner with us. 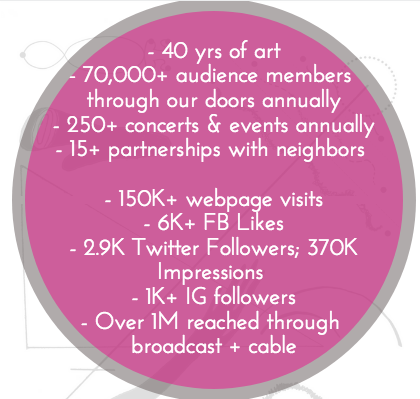 After four decades of unparalleled programming, our audiences are as diverse as the music, dance, and intermedia creations we present. Our state-of-the-art, multi-level hall seats up to 400 people, and our stage has been graced by both Pulitzer Prize-winners and early-career artists. Roulette offers a one-of-a-kind opportunity to discover something new, whether you’re experiencing a performance in person or engaging with the art and community that we foster through our wide-reaching online outlets, TV shows, radio broadcasts, and special events. A partnership with Roulette is as rewarding and enriching for your business as it is for the broad community we serve. If you’re interested in supporting Roulette, we invite you to become one of our Community, Premium, or Custom Sponsors. We always need goods and services to help make our concerts, fundraisers, and special events successful. Barter Sponsors receive credit on our sponsors webpage, social media channels, and have their business credited in our season zine. If you’d like to discuss a customized sponsorship with Roulette to meet your business’s goals – whether that’s sponsoring a series or season, underwriting our community partnerships with other non-profits focused on youth, education, human rights, etc., partnering with us for our upcoming 40th anniversary, or receiving discounts on our shows or rental rates – please contact Emily Bookwalter [emily@roulette.org (917) 267-2440].